Malayalam Manorama Vanitha onam pookalam competition 2014 details are given here. Winners will receive Rs 25,000, Rs 20,000 and many other special cash rewards. To be held on 4th September 2014, the venue of Vanitha onam pookalam competition 2014 fixed at Lulu Mall Edappally Ernakulam. Read more to know about the upcoming onam pookalam competition 2014. With hours left for the start of real excitement, malayalis around the globe are preparing to celebrate Onam with more pomp and vigour. Adding more power to their last minute arrangements, Vanitha in association with Asset Homes and Lulu Mall is arranging the most thrilling 'Onam Pookalam' competition. The event which has been conducted for the past few years is credited to be the biggest content considering the number of participants and prize money. 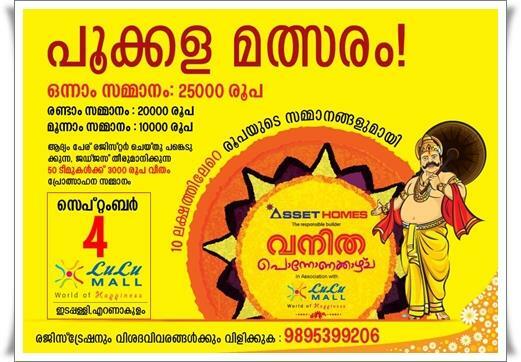 Titled Assent Homes 'Vanitha Ponnonakazha', comes with a bunch of cash rewards and early prizes. This contest with a total of Rs 10 lakh cash reward is exclusively hosted by Lulu Mall. Participants are invited to register their names while the competition will be held on 4th September 2014 at the specially arranged venue in Lulu Mall Edappally, Ernakulam. The title winner will be given Rs 25,000 in cash while the 2nd and 3rd prize winners are entitled to receive Rs 20,000 and Rs 10,000 respectively. The first 50 teams which register for the competition would get Rs 3000 each as consolation prize. The information regarding the competition has already been published in the Manorama daily. As the pookalam designing need too much effort and team work, organizations and groups can register their participation much early. Art, cultural organisations, schools, colleges, Kudumbashree units libraries, clubs, residents' associations and recreation clubs of employees' organisations can attend the Pookalam competition. Being a professional competition, participants are advised to go through the various rules and regulations much before crafting the Floral Carpets. The knowledge about the structured rules will give an upper hand in the competition. A preplanned innovative design and proper execution would give perfection to the work. As inventive plans do make the real point, a well organized strategy can give an edge in the floral carpet designing competition. Modified conventional thoughts adding more varieties of flowers, giving a transition to the circular shape with a theme depicting different cultural and social aspects of Kerala life will pave way to unique designs. So rush in your entries to book your seat for the Pookalam competition. Onam pookalam competition 2014 rules and regulations are given here. These rules can be converted to malayalam language for Onam floral carpet 2014 competitions. Go through this article to know the regulations which are followed during every Onam Pookalam competitions.